CEO Focus will serve North American business owners who strive for more. We will continue to grow only as fast as we can find top talent in a local market. For instance, there are some markets we do not currently serve. The reason for this is that we have not found a leader in that market who meets our standards. We would rather leave a market unserved than under-deliver to our CEO clients. 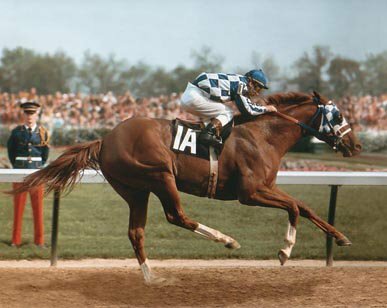 With the release of the movie “Secretariat” last week, the great race horse is again in the spotlight. Interestingly, there are several lessons business owners can learn from Secretariat. Owning a race horse is typically an exhausting and money-losing venture, much like a business with a poor business model. However, winning race horses such as Secretariat can make millions in prize money. In fact, Secretariat earned $1,316,808 in prize money during the mid-1970s. As part of his first crop at stud, Secretariat sired Canadian Bound, who was the first Thoroughbred yearling racehorse ever sold for more than US$1 million. At the 1976 Keeneland July sale, the auction bidding for Canadian Bound not only broke the $1 million barrier, but the colt ended up being sold for $1.5 million. He also sired General Assembly, who won the 1979 Travers Stakes at Saratoga while setting a still-standing race record of 2:00 flat. Andrew Beyer has said that General Assembly's speed figure in that race was one of the fastest in history. Like Secretariat in the Belmont, General Assembly never duplicated that performance in another race. How does this apply to your business model? Many businesspeople find themselves chasing the equivalent of race prize money. The endeavor is profitable, but it is not where the REAL money lies. The real money and the best business model is the stud farm business. What is your version of the stud farm business model? Winning races is still important in the stud farm business model. After all, who wants offspring from a losing horse? Many CEOs find themselves with a winning racehorse but a moderately profitable business model. These CEOs spend all their time, energy, and money trying to build a better race horse. Instead, they should focus on building a better stud-horse. Quite simply, some business models are better than others. The race horse business model is inferior to the stud-horse business model. Savvy horse owners understand that a winning race horse is a cost of entry into the lucrative stud-horse business model. Ask yourself, what portion of my business is like the racing business model? How can you transition or augment your business model to be more like a stud farm? The answer might be worth millions of dollars. Previous Post10 Initiatives using the crowd to generate new ideasNext PostAre Black Friday Blowouts Bad for your Business Model? Copyright © CEO Focus, LLC. All rights reserved.